Live Broadcast of the SAWMG | Uniting seven federations of the traditional mind sports : Chess, Bridge, Draughts, Go and Xiangqi with over 500 National Associations and close to one billion players. 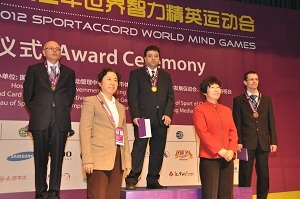 You will find below the details (day by day) of the broadcasting of the SportAccord World Mind Games held in Beijing. You will find the 8 Daily Bulletins of the 2nd World Mind Sports Games held in Beijing – December 2012, with all the results of the competions and reports on the cultural events…. During the 2nd SportAccord World Mind Games, you will be able to follow your sport live. You will find each day a link on this site….